… Jamie Wieck’s Fifty Things Every Design Student Should Know— good counsel (analogically, and in some cases indeed, literally) for folks hoeing just about any row. As we check again the color of our parachutes, we might recall that it was on this date in 1650 that the first legal corporation was formed in the Americas: The Harvard Corporation, the more powerful of the two administrative boards overseeing Harvard University. Ioannidis laid out a detailed mathematical proof that, assuming modest levels of researcher bias, typically imperfect research techniques, and the well-known tendency to focus on exciting rather than highly plausible theories, researchers will come up with wrong findings most of the time. Simply put, if you’re attracted to ideas that have a good chance of being wrong, and if you’re motivated to prove them right, and if you have a little wiggle room in how you assemble the evidence, you’ll probably succeed in proving wrong theories right. 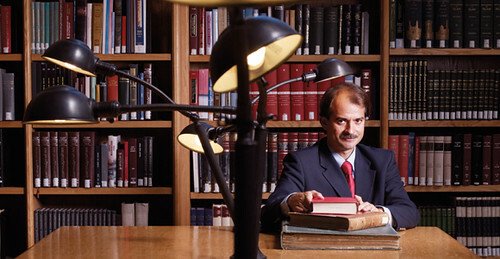 His model predicted, in different fields of medical research, rates of wrongness roughly corresponding to the observed rates at which findings were later convincingly refuted: 80 percent of non-randomized studies (by far the most common type) turn out to be wrong, as do 25 percent of supposedly gold-standard randomized trials, and as much as 10 percent of the platinum-standard large randomized trials. The article spelled out his belief that researchers were frequently manipulating data analyses, chasing career-advancing findings rather than good science, and even using the peer-review process—in which journals ask researchers to help decide which studies to publish—to suppress opposing views. “You can question some of the details of John’s calculations, but it’s hard to argue that the essential ideas aren’t absolutely correct,” says Doug Altman, an Oxford University researcher who directs the Centre for Statistics in Medicine. As we seek third and fourth opinions, we might send studious birthday wishes to Elizabeth Cabot Agassiz (née Cary), the naturalist and educator who was the co-founder and first president of Radcliffe College; she was born on this date in 1822. After the death of her husband, Swiss naturalist Louis Agassiz, with whom she traveled on scientific expeditions, she settled on the idea of college for women in the “Harvard Annex” in Cambridge; in 1894 the Annex became Radcliffe College. She served as its president until 1899, then honorary president until 1903. Her books include A First Lesson in Natural History (1859), and A Journey in Brazil (1867). Stumped by what to give your egomaniac boyfriend on his birthday? Consider Sean John’s (Sean Combs, a.k.a. P. Diddy) “I Am King” cologne, bursting with notes of sandalwood, orange and self-congratulation. 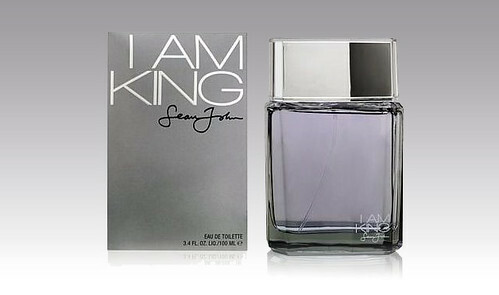 And there’s plenty more where that came from: “I Am King of the Night” is another Sean John scent available for narcissistic insomniacs. Photo courtesy of FragranceNet.com. 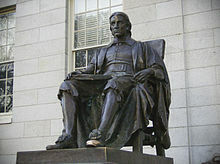 The Daniel Chester French statue of Harvard that stands in Harvard Yard is inscribed “John Harvard, Founder, 1638.” But it’s referred to by students as “the statue of three lies,” as the institution was actually established in 1636 by the General Court of the Massachusetts Colony– and the person depicted isn’t Harvard (who was unavailable, by reason of death, for sittings), but a College student. That said, Harvard Bridge, which was also named for John Harvard, is reputed to be a pretty fair likeness.